An oasis in the Chihuahuan Desert, Carlsbad, New Mexico is approximately 120 miles north of El Paso, Texas. A nice town with plenty of hotels, restaurants, and a Wal-Mart, Carlsbad makes a good base camp from which to stock up and explore the area’s most significant attraction, the Carlsbad Cavern National Park. Just south of town, a small brown sign lets you know to turn right and begin the five mile ascent on a twisting paved road through the area designated as Carlsbad National Park. The drive ends at the visitors center, the gateway to the caverns, but before you go in, take a look out over the valley stretched out below and imagine it during the Permian Age 286 million years ago, as a vast open sea. At that time, the sea stretched across an area of land covering virtually all of what’s now the western United States, retreating as the Paleozoic Era came to an end. Because of the natural mountain boundary, a massive (250 miles wide, 300 miles long) salt sea basin remained in its place, covering an area made up of present day southeastern New Mexico and West Texas. Over the next 38 million years, the remaining sea slowly evaporated depositing sediment rich in potash across the valley floor. Potash is a valuable ingredient in fertilizer, but nineteenth-century settlers found more use in the vast stores of bat guano, selling it first for fertilizer and later for the saltpeter that was an active ingredient in gunpowder. Mid-twentieth-century exploration found oil buried under the region, and to date almost 15 billion barrels of oil and 2.3 trillion cubic feet of natural gas have been extracted from the area. For scientists, however, the caverns themselves are the most valuable natural resource. To the scientific community, the limestone caverns and surrounding mountains provide an opportunity to study an ocean reef from the inside. Though the reef was made of mostly sponges and algae, which have long since disappeared, live bacteria still grows in the underground water pools, and well-preserved fossils have been found in the rock. Unfortunately, everyday tourists do not get to dig for fossils or collect bacteria samples. Instead, they come to see the effects water can have on solid rock. Inside the visitors center, a ticket buys access to the main cavern which can be reached quickly by an elevator ride, or alternatively, an hour-long walk through the “natural” entrance. The mouth of the cave was discovered long ago by Native Americans; settlers pushing West also explored the caves, but men were not the first visitors. The Mexican Free-Tailed Bat has been making Carlsbad Caverns its summer home for over 5,000 years. More than 200,000 bats currently reside in the cavern, and their evening flights en masse to hunt for food provide a magnificent experience for tourists. The bats live and bear young inside the cave due to the consistent climate. Temperatures can be extreme above ground, but inside the caverns, temperatures hold steady around 56 degrees–be prepared to adjust to the change in conditions. In addition to the strong sulfur smell, the path is steep, slippery, and poorly lit in many areas. On the way down, but especially when you reach the cavern floor, stalagmites and stalactites are a feature attraction. Like an elaborate cathedral created by nature, the main area of the cavern is called The Great Room. 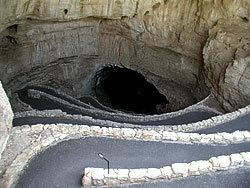 It is the largest natural underground chamber in the United States, with appropriately named formations, such as Doll’s Theater and Whale’s Mouth. In 1923, the U.S. Department of the Interior sent inspectors to judge the aesthetic worth of the caverns. One inspector named Robert Holley had to say of Carlsbad,”…I am wholly conscious of the feebleness of my efforts to convey in the deep conflicting emotions, the feeling of fear and awe, and the desire for an inspired understanding of the Devine Creator’s work which presents to the human eye such a complex aggregate of natural wonders…” The area was designated a national monument on May 13, 1930. In all, thirty miles of passageways can be explored, although, most of the areas beyond the Great Room require a separate admission and guide. 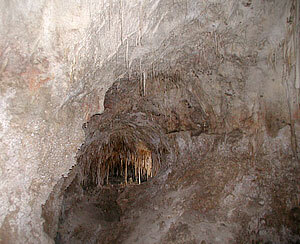 A total of 100 caves have been discovered in the area, encompassing 46,766 acres, including Lechugilia Cave. At 1,567 feet, it’s the deepest in the United States. In addition, thirty-five miles south of Carlsbad National Park, across the border in Texas, are the Guadalupe Mountains, which functioned as part of the natural boundary of the Permian Basin. Today, they provide hiking, camping, and four-wheel drive opportunities through desert, canyon, and highland environments. For more information on all the attractions in the Carlsbad/El Paso corridor please visit http://www.nps.gov.